It's my contention that unless a person can consistently achieve a deceleration rate of at least 0.7g's, that person is not 'qualified' to ride a motorcycle on public roads. Further, if a rider can consistently achieve deceleration rates of at least 0.8g's, he or she is a competent rider in terms of braking skills. Many riders use parking lot practice sessions in order improve their braking skills. They mark out an area on the parking lot with a starting gate and some distance markers. Thus, when they begin a braking test from 20 mph, for example, they can determine what their average deceleration rate was during their stop by merely noting the distance it took to stop. 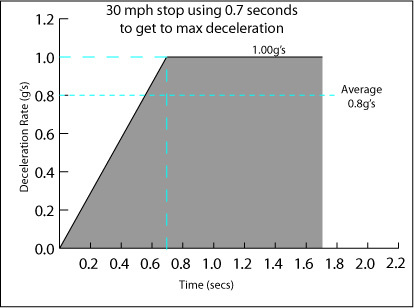 A distance of almost 17 feet indicates that the rider achieved an average deceleration rate of 0.8g's during the stop, if starting at 20 mph. 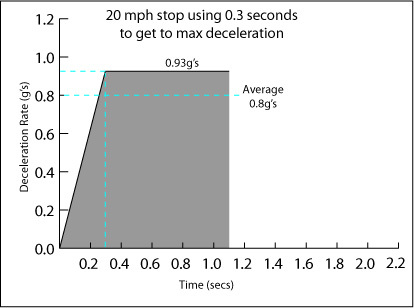 But very few riders have any idea what their actual deceleration rate was throughout their stopping effort. Knowing what I'm about to share with you can help you avoid a nasty spill on that parking lot, and can lead to much better braking performance in an emergency. Let's explore the idea of 'rapidly squeezing' the front brake lever during an emergency stop. It should never take you as long as .7 seconds to reach maximum squeeze pressure on your front brake lever when you are trying to stop aggressively. In fact, most people can easily hit their maximum squeeze pressure in .5 seconds, and with practice you should be able to reach maximum in about .3 seconds. There's a huge difference between reality and the well intentioned suggestion of 'about one second'. I remind you that on the parking lot, when practicing quick stops, you will reach a given speed such as 20 mph as you approach a starting 'gate', and then begin an aggressive squeezing of your front brake lever, maintaining your maximum squeeze pressure until you've come to a complete stop. Then measure the distance of that stop in order to determine your deceleration rate. And, though this article focuses on the front brake usage, any emergency stop should begin with the application of both brakes, not just the front one. 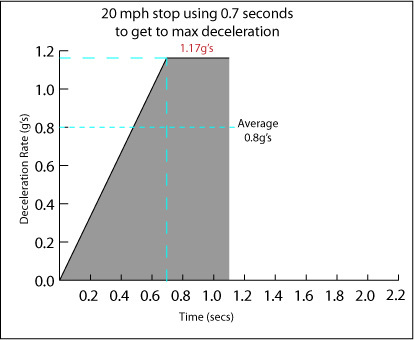 Assuming you want to achieve a 0.8g deceleration rate, you must be able to stop from 20 mph within approximately 17 feet. 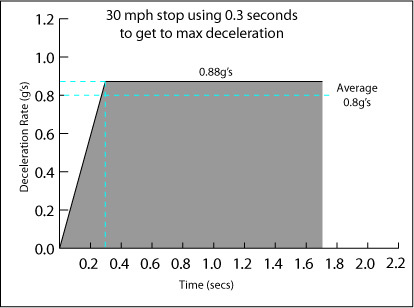 If you average a deceleration rate of 0.8g's, you will come to a complete stop in 1.1 seconds (and take 16.7 feet). 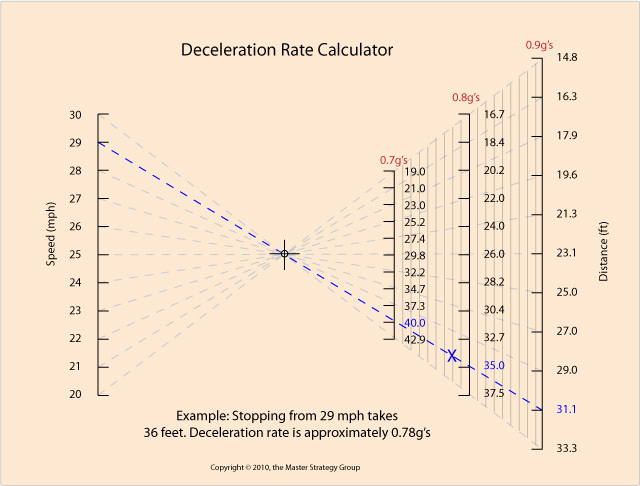 The chart above shows that for the last 0.8 seconds you must have achieved a deceleration rate of 0.93g's, because for the first 0.3 seconds you had to have achieved half of that rate.